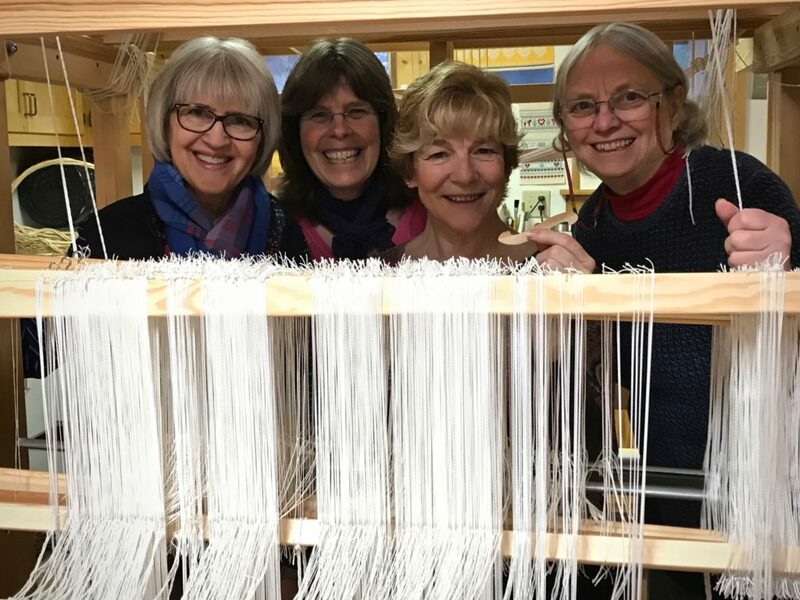 Seven enthusiastic weavers came to the Discovery Towels Workshop I presented a few days ago. We had three wonderful days together. 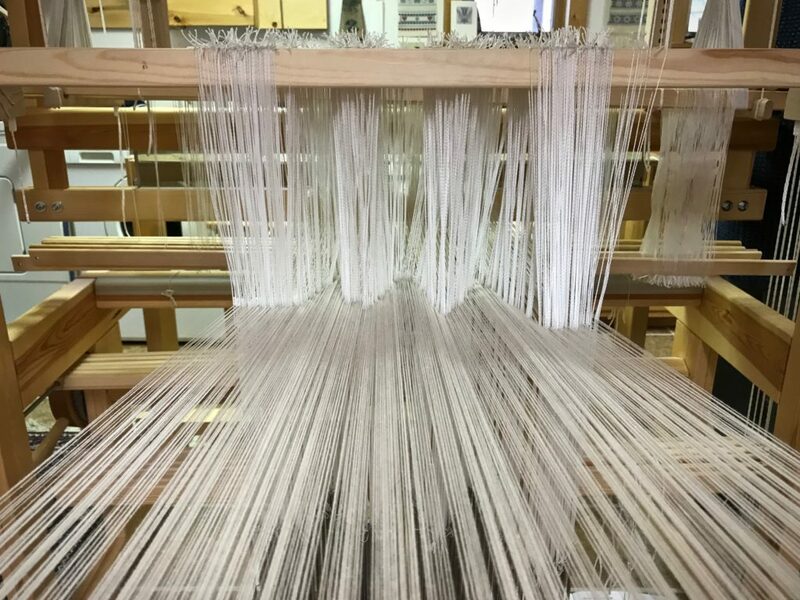 Thick and thin threads can do spectacular things when you combine them in the warp and weft. 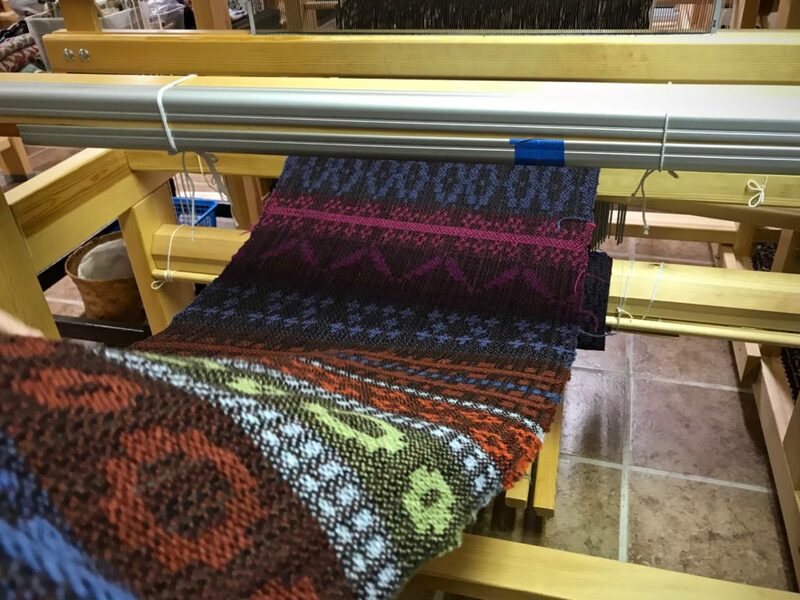 And Eureka Springs, Arkansas is the ideal setting for such a weaving adventure! This is a unique, quaint little town like none other. The Victorian-style homes, and the twisting, winding roads that follow the hillside contours make you feel like you are in a storybook village. We happened to be there at the same time as the annual Volkswagen Festival and Parade, which defies description. You just have to experience it for yourself. 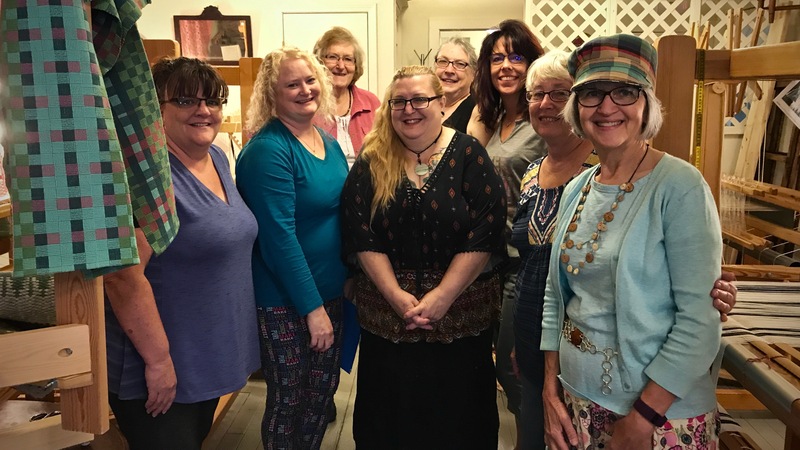 Debbie Davis of Red Scottie Fibers, our gracious and knowledgeable host, provided the perfect setting in The Shoppes at Fleece ‘N Flax. Her classroom space is full of Glimåkra countermarch and counterbalance looms. What could be better?! You will be amazed when you see the beautiful towels that these seasoned and not-yet seasoned weavers produced! It was a joy to have some time with these enthusiastic discoverers. May you enjoy the thrill of discovery. I hope you, your family, and your Houston home remain safe! So glad you had a great workshop. Love these towels! Beth, Thank you. So far, we’ve escaped the worst. 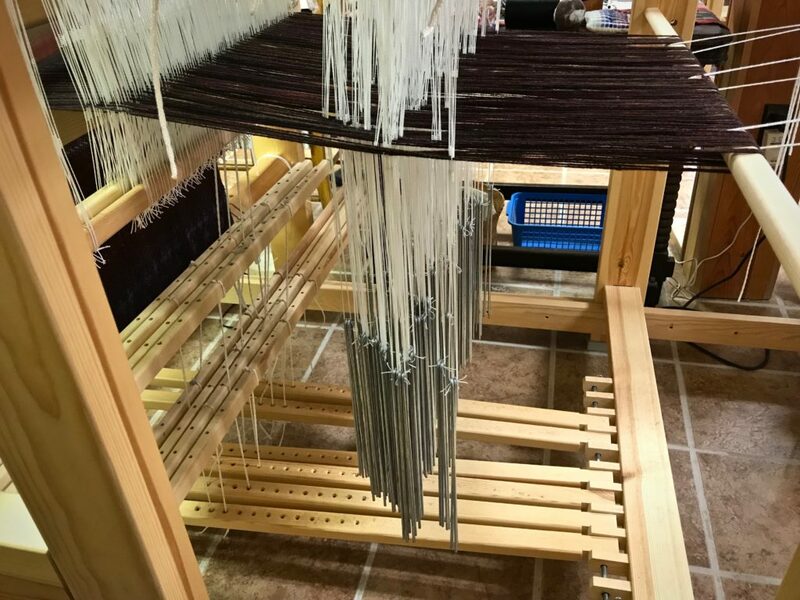 It was fun to see the towels grow on all the looms! The students were fantastic! I hope you and your family and home are spared from the flooding. Kay, Thank you. I appreciate your kind thoughts so much! Very glad your safe Karen. My thoughts and prayers to everyone in the Houston area. Holly, Thank you. That means so much! Hi Bev, We are thankful to be out of harm’s way. News from our neighbors this morning is that the water on our street is finally receding. That’s a big relief! I have been worried about you the last few days and I’m so happy to hear you are ok! Stay safe, lots of prayers going on for Texas. Hi Liberty, Thank you so much for your thoughtful concern, and for your prayers for the people in Texas. I wondered where you were. Glad you are safe and out of Houston. 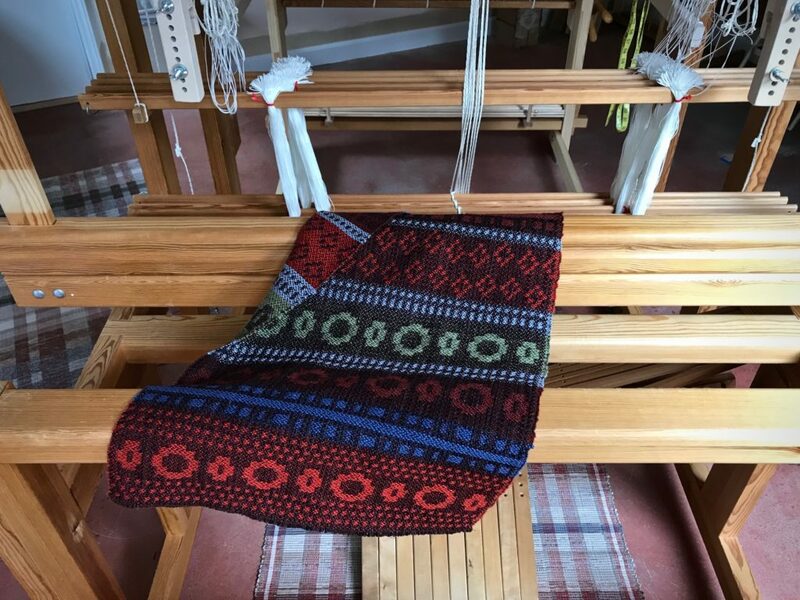 We are safe and dry here, but some of our weaving friends are not so fortunate. Hi D’Anne, I’ve been concerned about our weaving friends. I know some parts of Katy got hit pretty hard. I’m glad you’re doing okay, too. Very treasured memories. Thank you for sharing your time and knowledge. You and Debbie make a great team. I got caught up in the Volkswagon parade and counted about 350 of them, all shapes, sizes,and models. what a hoot!! Also praying. Our prayers make a difference. Thanks! I am so relieved to hear that you are dry and safe and that your home is ok. You have been in my thoughts daily. Isn’t Eureka Springs the coolest place? 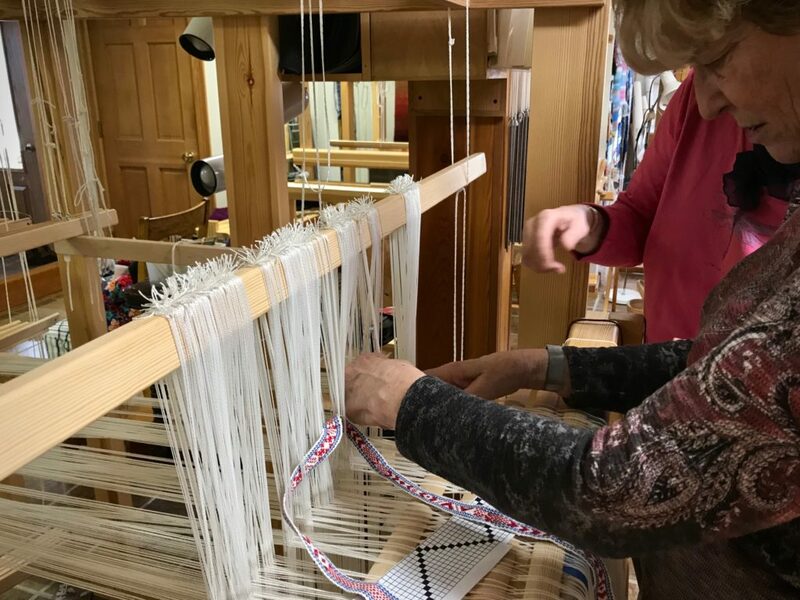 I wish that I was enough of a weaver to have taken your class, but weaving is going to be my ‘dream job’ after I retire in two years. I love those towels, and your students did great. You have the soul of a teacher, Karen. 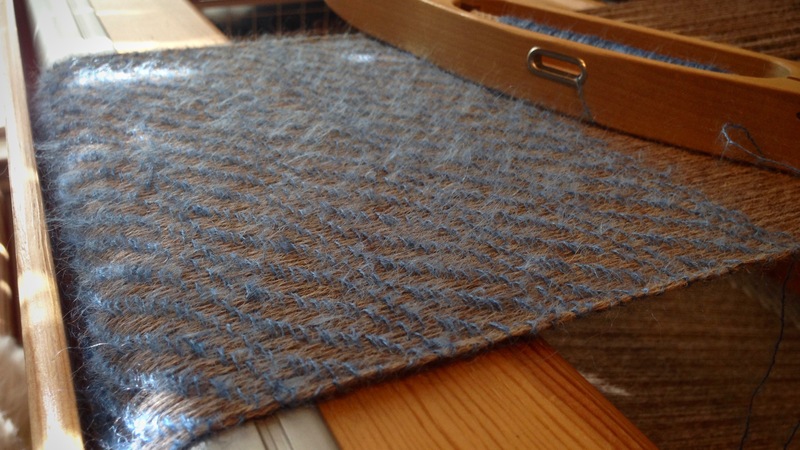 When are you going to write a weaving book? Hi Theo, I appreciate your kind concern! 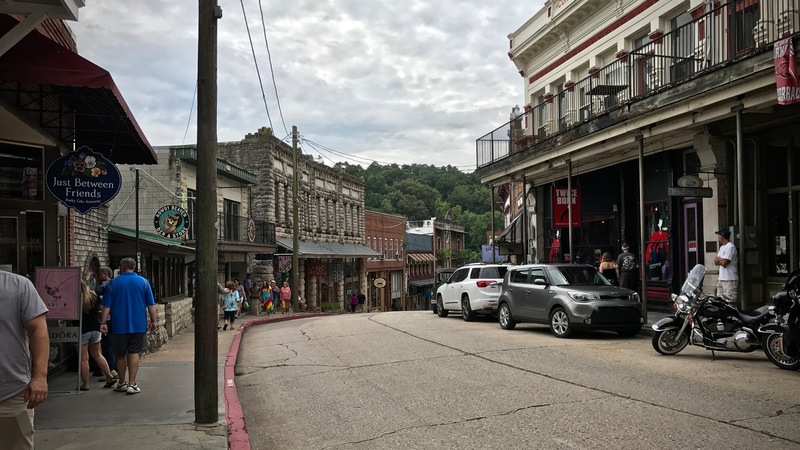 Yes, Eureka Springs is a fun place to be. 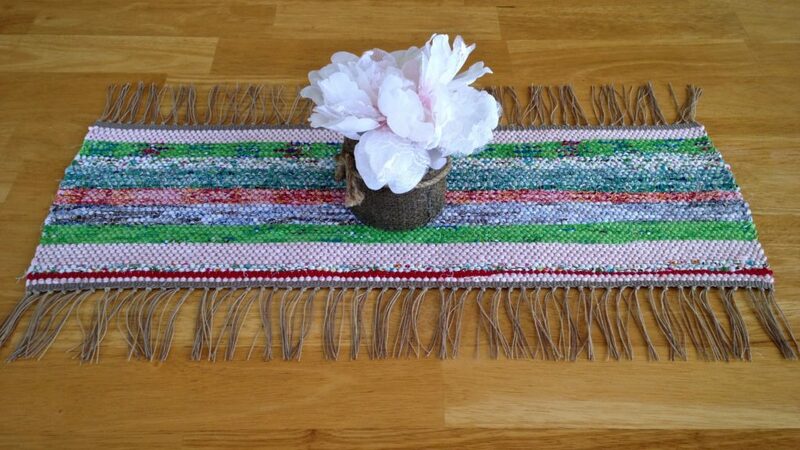 When am I going to write a weaving book? You’re reading it. Haha. I do have teaching in my soul. I love the idea of helping other people learn. beautiful towels. Prayers, positive thoughts coming to you and your community. Hi Angie, All the weavers did amazing work! It was a fun group! Thank you for your kind thoughts and prayers. It’s very appreciated! Ettenna, It must be very frightening. 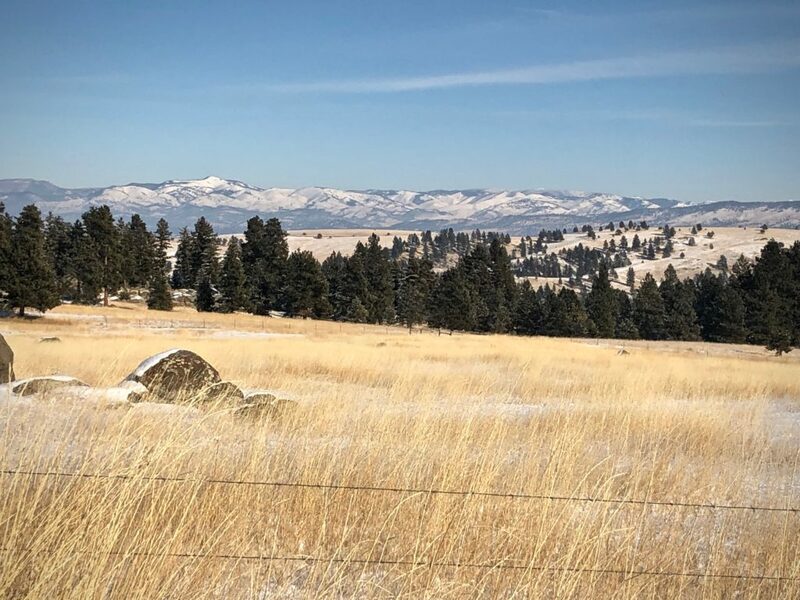 I will pray for Montana. Thank you for letting me know. 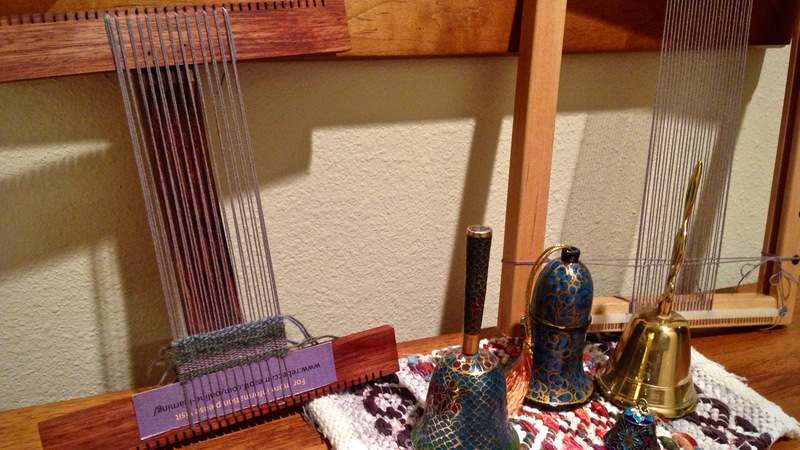 One more little tapestry loom? 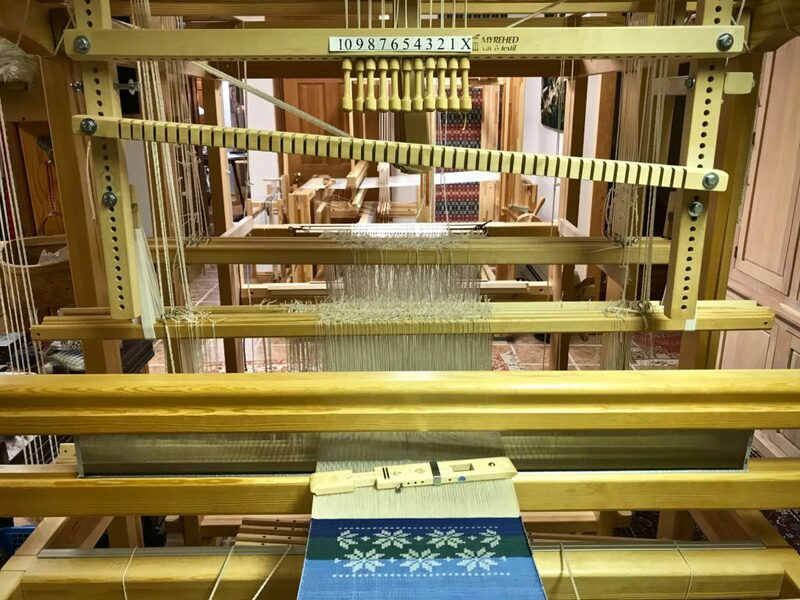 I signed up for Rebecca Mezoff’s Weaving Tapestry on Little Looms online class, and ordered a Hokett loom to go with it. 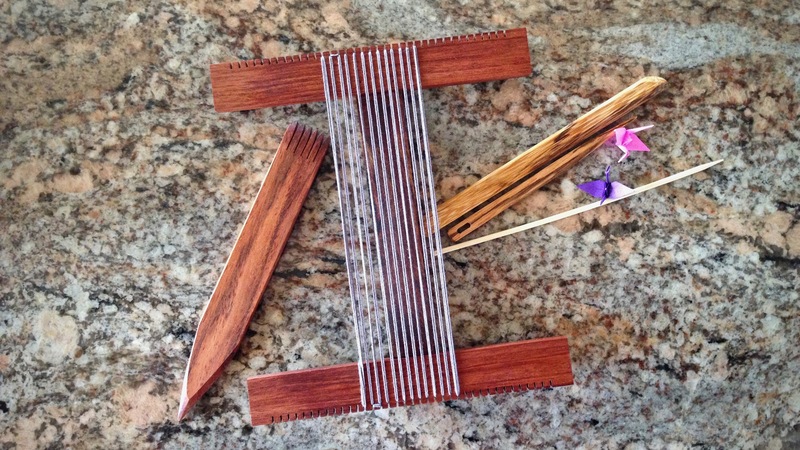 This petite 7″ x 8″ loom is made by Jim Hokett, who uses exotic woods for the looms. Mine is made of bubinga and chechen woods. Very pretty and nice to the touch! 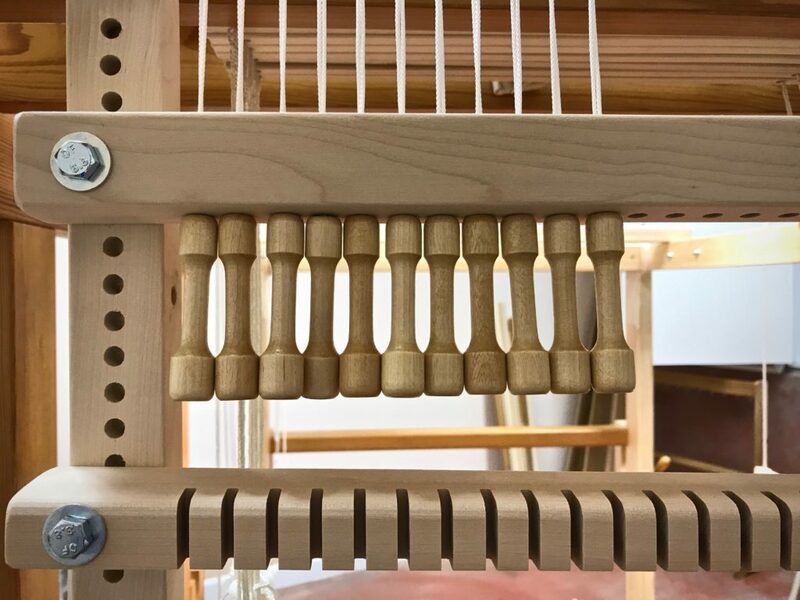 This is a 6-dent loom, and I have warped it double, to have 12 ends per inch. 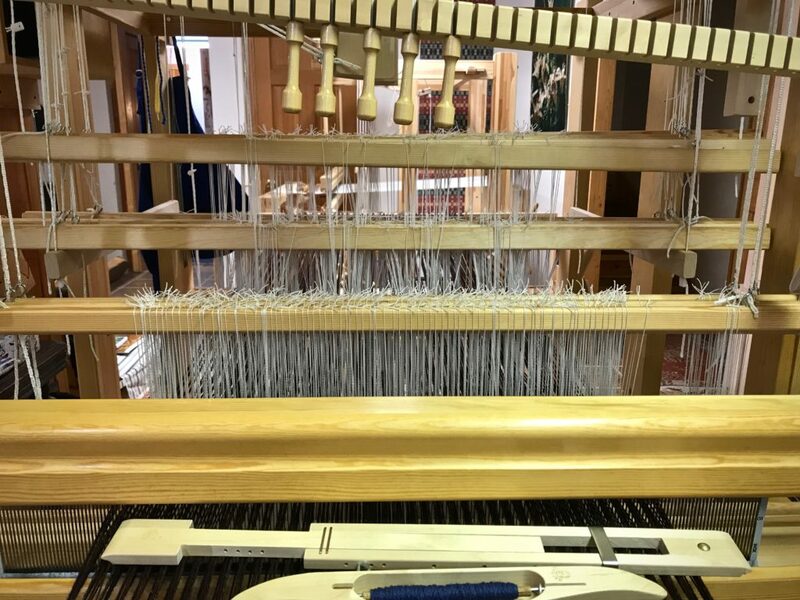 Hokett 6-dent loom is warped 12 ends per inch by warping 2 ends per dent. I am not accustomed to using a tapestry beater or a shed stick. It will be fascinating to try some new things! 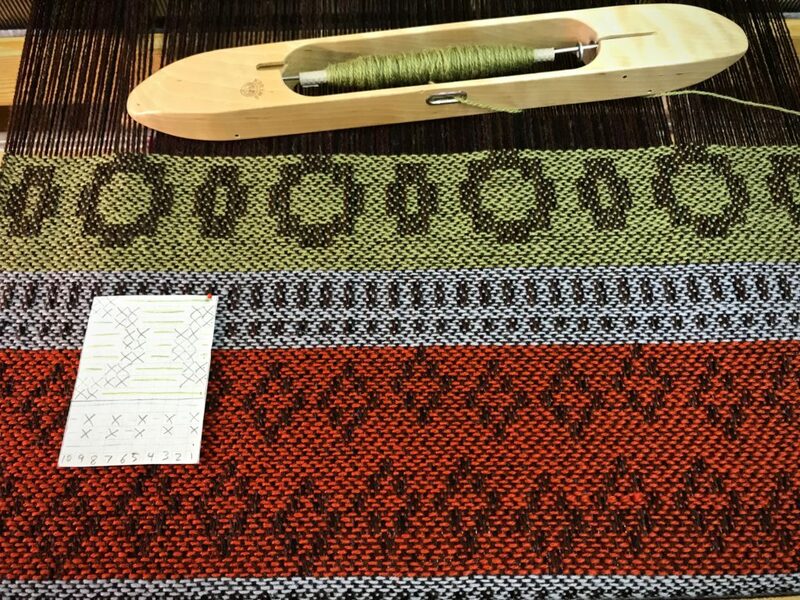 I did some weaving while riding in the car. I finished the header, a short hem, and a row of special knots for the hem’s turned edge. 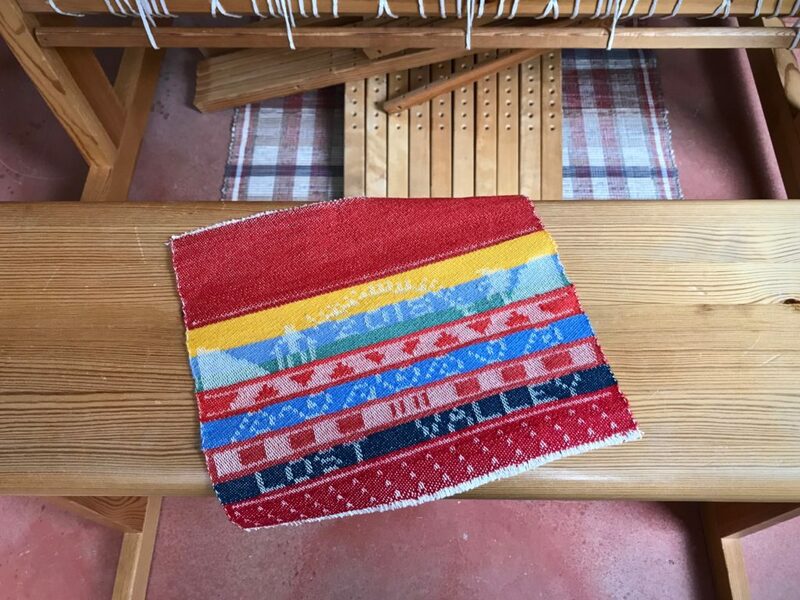 In this course, I am practicing some basic small loom tapestry techniques. Rebecca has a very organized, clear teaching style, so it’s a joy to learn from her. As I practice, I am reviewing things I have learned previously; and I am picking up great tips that are new to me. 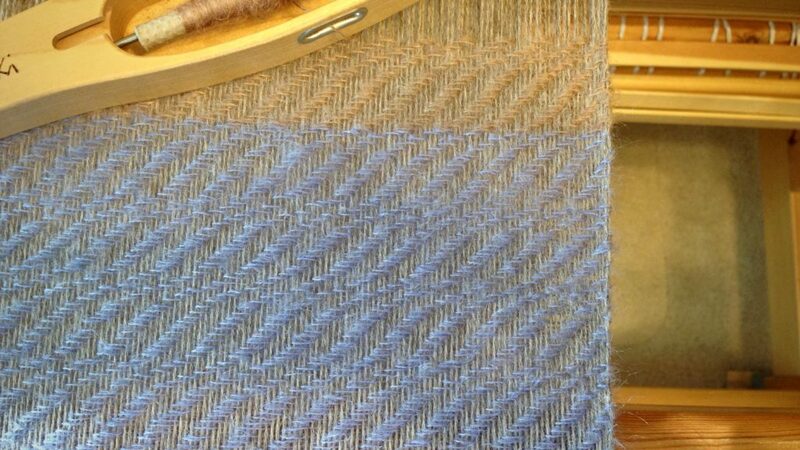 And, for once, lo and behold, I am weaving tapestry from the front! May your new year start with learning something new. 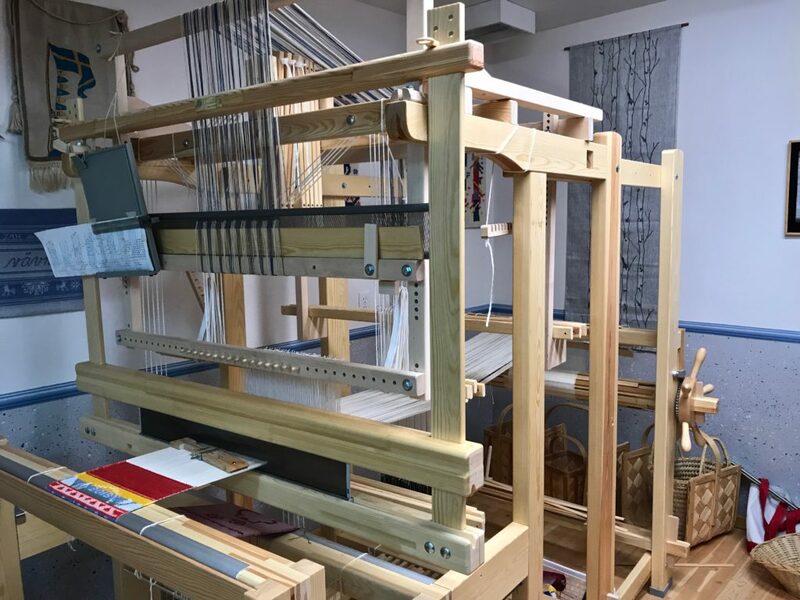 I almost bought one of those little hokett looms once for sampling. They are so cute. What would you do with such a little tapestry? I can’t wait to see. 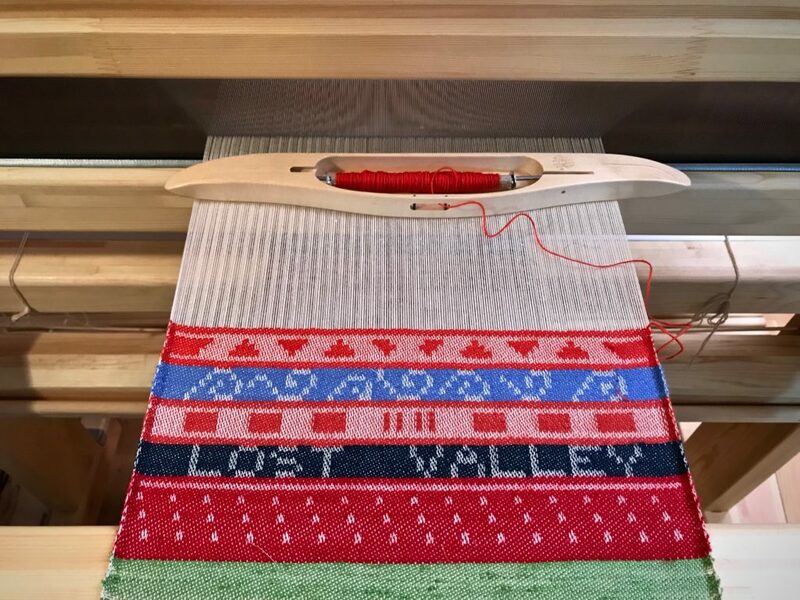 Hi Leigh, The little Hokett looms would be great for sampling for larger tapestries. I don’t have a specific end in mind. Sometimes I mount the small tapestry and put it in a frame. Most of the time, though, it’s an exercise for my fingers and my mind. I’m not at the point where I’m making masterpieces yet. I followed Rebecca and her time spent in the Petrified Forest. I love her work and would one day like to take a class from her. The online class sounds like a great way to begin. I’m looking forward to seeing your progress. Beth, I follow Rebecca on Instagram. 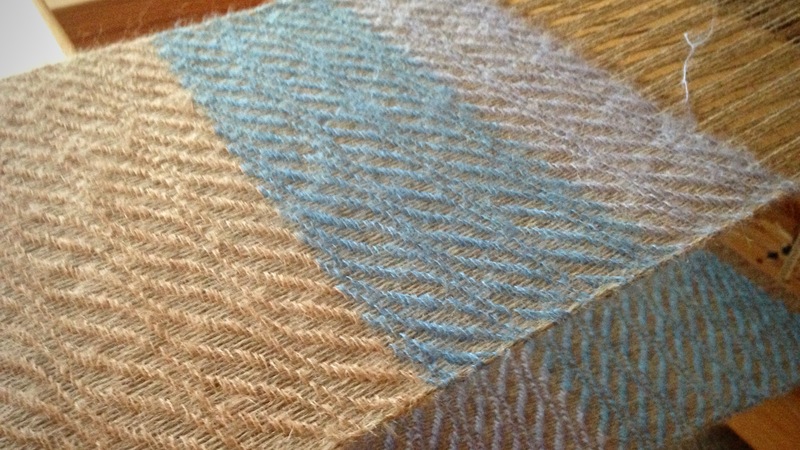 Her small tapestries from the Petrified Forest were very interesting. After seeing other students’ work on IG, I decided to go for it myself! 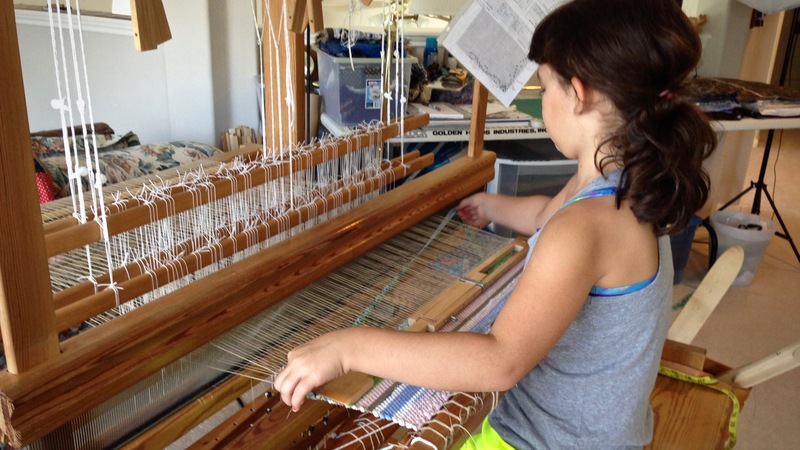 Hi Betsy, Rebecca shows a Lost Pond loom in her class. 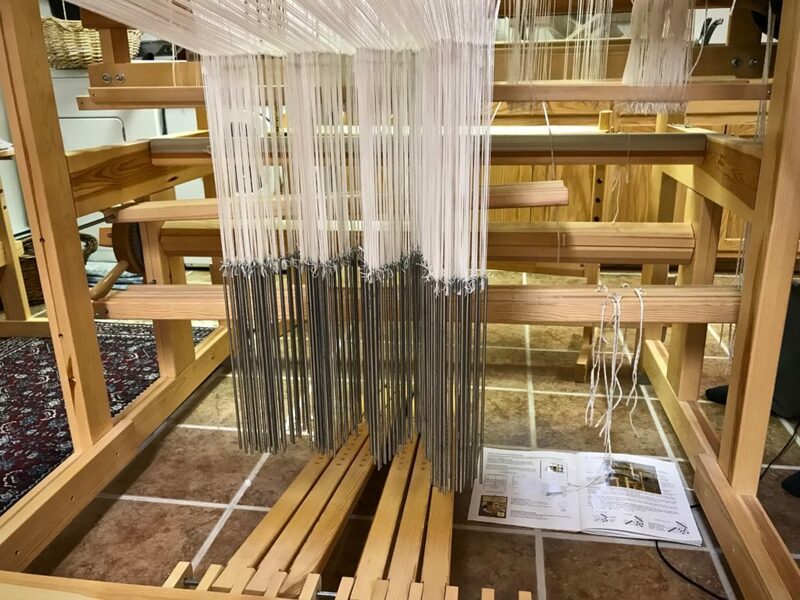 It looks like a good frame loom! Vavstuga Basics!! WooHoo! You’ll love it. 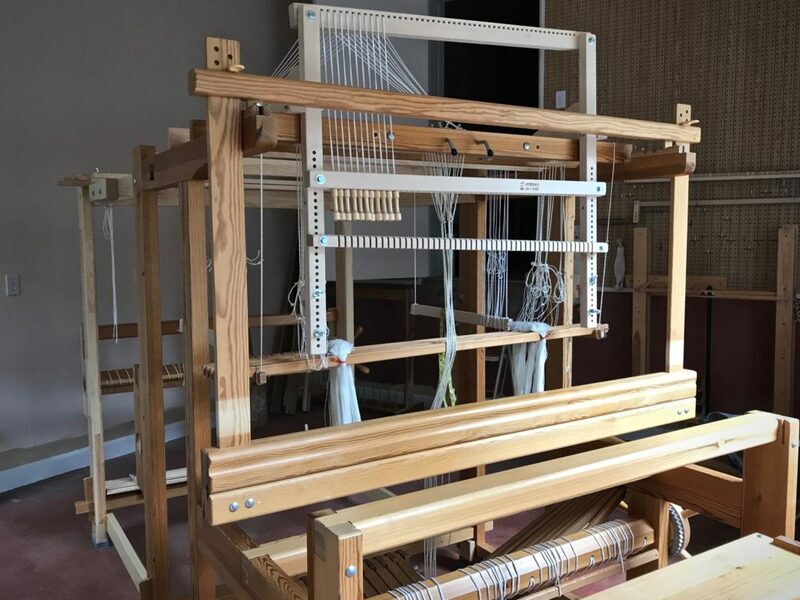 Also just bought a Hockett loom – in red zebra wood !! Same size as yours. Just experimenting with the loom now with traditional tapestry techniques and soumak which I really enjoy, Soumak stitches provide a 3 demensional accent or frame to the other stitches. Currently working with cotton perle but want to try silk. Planning to make a small flat purse for frequently used credit cards for my purse. I may add a braided necklace and wear it as a piece of textile jewelry. Louise, I love the wood. 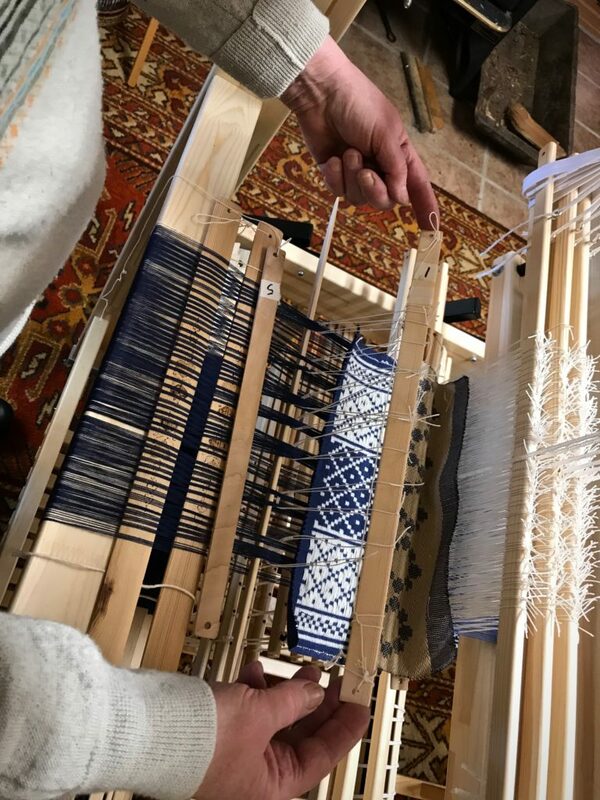 There is something special about holding wood in your hands that makes the tapestry work that much more interesting and special. 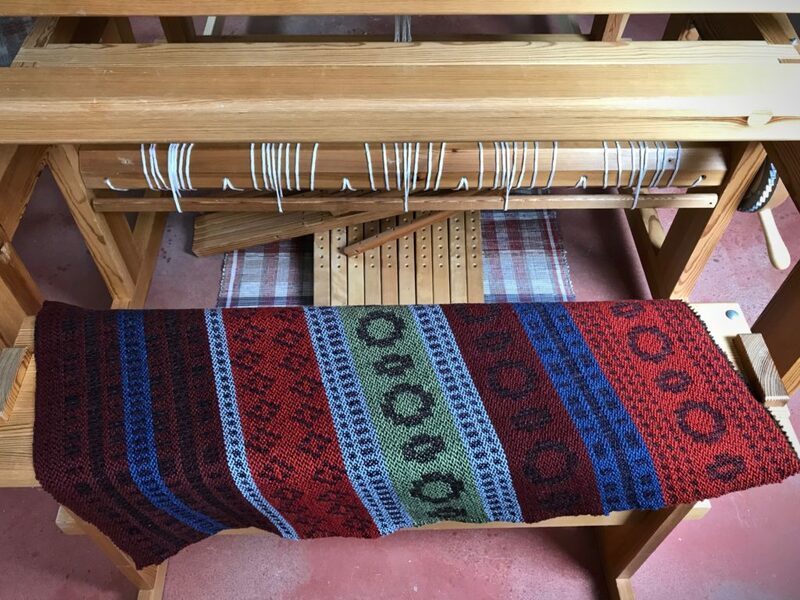 I have done a little bit of soumak on this loom, too. It’s something I’d like to explore some more. I’d love to see what you’re making! The purse and textile jewelry sound fascinating!